The tremendously popular ESHU directs traffic along the Road of Life from his abode at the Crossroads of Fortune. If you’re faced with an important choice or a powerful opportunity, ESHU can offer advice to help swing things your way. A super-speedy go-between, he can carry complaints to the Gods, questions to the spirit world, and messages to any living thing. He serves Ifa, the chief god, as a messenger between heaven and earth. This Eshu is a dancer and a lover of money. Among its characteristics are that it is very mocking, gluttonous, spoiled and often malicious. Eshu requires constant appeasement in order to carry out his assigned functions of conveying sacrifices and divining the future. One myth depicts Eshu as tricking Ifa out of the secrets of divination; another, in which Eshu restores Ifa from his imprisonment in a palm tree, casts him as the founder of the Ifa religion. 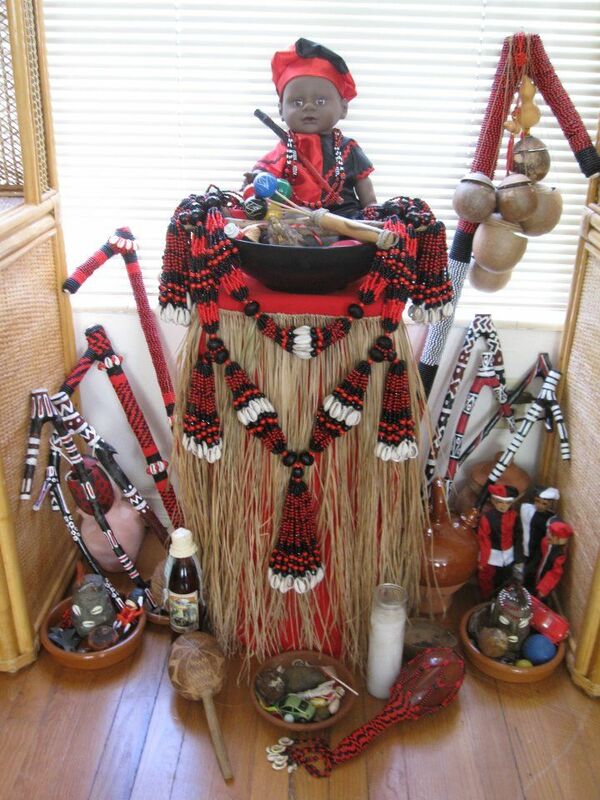 An elaborate shrine to the Orisha Eshu featuring His trademark colors of red and black. 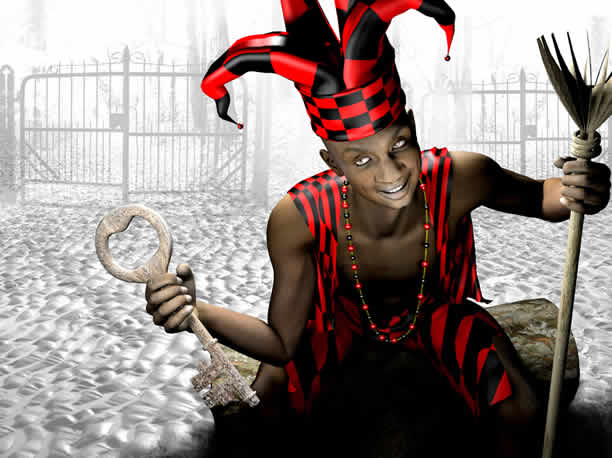 Eshu’s Trickster energies are likened to that of a child’s. 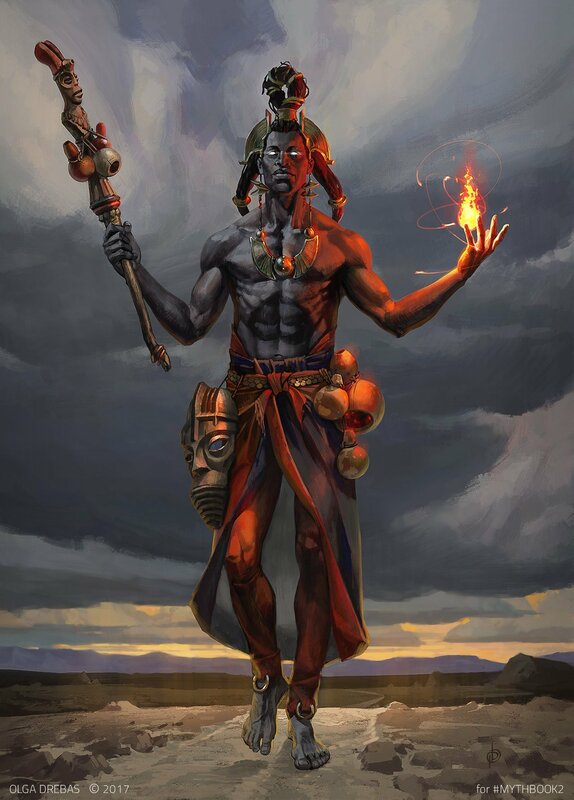 With his connections, ESHU can be a powerful ally. But he’s also a Trickster God with a sense of humor and will often throw a spanner in the works to keep life interesting. This could explain why we don’t always get what we want. Be careful — this master of crossroads is also a master of cross-purposes. The perfect deity for the internet age. This master of crossroads is also a master of cross-purposes. Interestingly, while ESHU is often portrayed as an old man, another incarnation is that of a young child, because he is associated with both the end and the beginning of life. He is typically dressed in red and black, and often appears in his role as warrior and protector. Another incarnation of Eshu is that of a young child, because he is associated with both the end and the beginning of life. 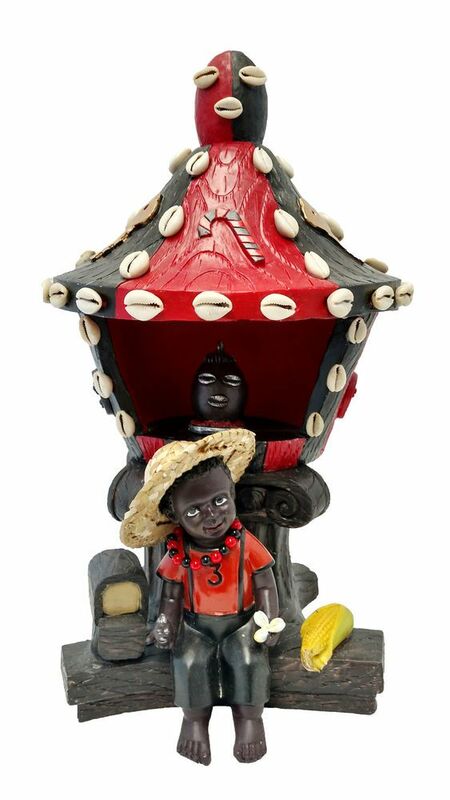 For many Santeros, it is important to give ESHU his due, because he plays a role in every aspect of our lives. While he offers us opportunity, he is just as likely to throw an obstacle in our way. 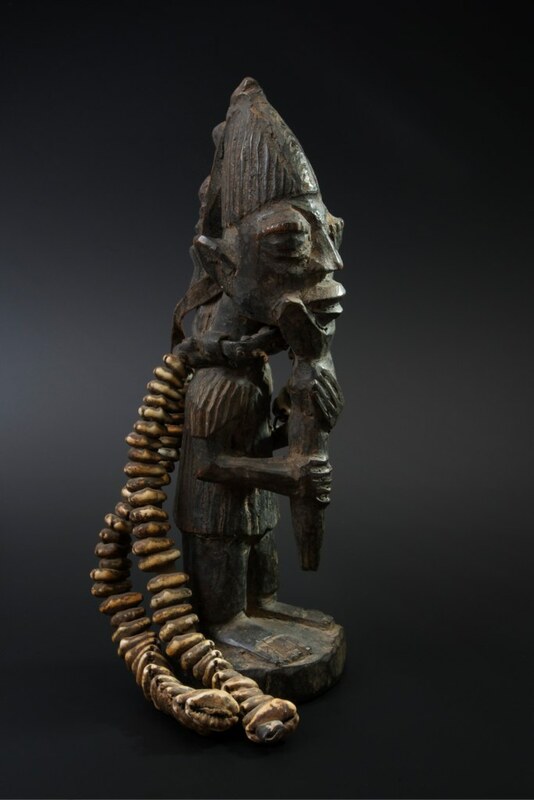 ESHU originates in the Yoruba culture and religion of West Africa. 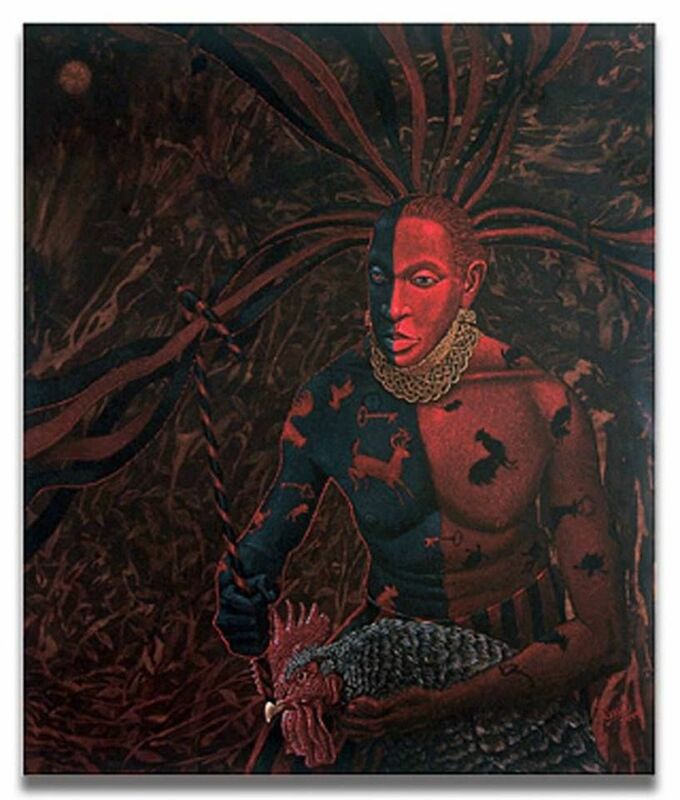 One of the most mystifying stories about the deity is that Eshu painted half of his body black and half red. Half of his garments were crimson, and half were pure black. Thus attired, he walked down a street running through the lands of his followers. Half of his people saw him as a powerful red deity, while the other half saw him as a beautiful black god. Soon the worshipers were arguing about what they had seen, then they were fighting, and finally the machetes came out and they were killing each other. Neighbors hacked apart former neighbors in a holy war about the nature of their god. Eshu painted half of his body black and half red. Half of his garments were crimson, and half were pure black.